E3Live + BrainON is back in stock! You are here: Home /E3Live + BrainON is back in stock! *Due to the nature of this product needing to be kept frozen E3Live + BrainON is available in store only. E3Live + BrainON – Certified Organic Fresh Frozen E3Live (Aphanizomenon flos-aquae) with a super concentrated Organic AFA extract of Phycocyanin and Phenylethylamine (PEA). E3Live + BrainON contains the active ingredient in wild-harvested AFA that may help promote mood balance and enhanced focus. * E3Live + BrainON offers a concentrated extract of phenylethylamine (PEA) as found in AFA. In chocolate, PEA is known as the “love molecule.” E3Live + BrainON, however, contains more bioavailable PEA than chocolate. PEA is a naturally occurring extract that promotes clear thinking and focus to give you optimal cognitive function – and it’s MD endorsed. E3Live + BrainON is for anyone who wishes to balance mood and increase concentration, while functioning at a higher level. E3Live + BrainON contains the active ingredient in wild-harvested AFA blue-green algae that both promotes mood balance and enhances focus. In fact, no other product competes with E3Live + BrainON in terms of promoting joyfulness and brain clarity benefits with no side effects. E3Live + BrainON improves health. It’s good for you! PEA was found to be significantly lower in subjects with Attention Deficit Disorder. People taking E3Live + BrainON with Phenalmin report better attention at school and at work. E3Live + BrainON is for anyone who wishes to balance mood and to increase concentration. 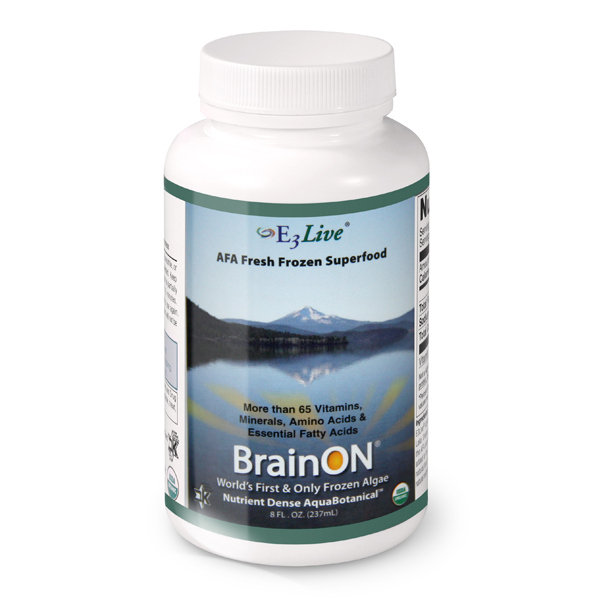 One of our client favorites, E3Live + BrainON helps you to enjoyably function at a higher level. Serving Size: 1 tablespoon. Most people begin at 1 teaspoon a day and work up. No two people are alike. Some people will eat E3Live + BrainON in more liberal quantities, even several ounces a day, whenever they need an added boost. Work your way up at your own pace. Trust your intuition. We suggest drinking a few ounces of pure water after each use. For Maximum Results & Benefits: Once you’ve used the suggested starting amount for a couple of weeks, we recommend using roughly 1 bottle per week to receive maximum results. Suggested Use: To protect freshness, keep frozen. When ready to consume, measure a defrosted portion of E3Live + BrainON into another container, enough for approximately a 7-day supply, and store in the coldest area of your refrigerator compartment for ongoing daily use. Place the remaining frozen portion, still in the original bottle, in your freezer compartment until you need to replenish your daily reserve by defrosting another 7-day supply. For fast defrost, place bottle in cool water outside of refrigerator for about 15 minutes. For slower defrost, place full bottle in refrigerator compartment for a few hours, then pour off 7-day supply into another container and place in refrigerator compartment. Store the remaining frozen portion (original bottle) in freezer compartment. Defrosting times will vary. Important Note: In defrosted liquid state, E3Live + BrainON must be kept cold and refrigerated at all times to maintain its freshness. Shelf-life out of freezer in refrigerator is between 7 to 10 days. “E3Live + BrainON has changed my life in many ways. It has helped raise my grade point average by a full point. My stress level has decreased, and I am able to retain greater amounts of information. My ability to focus for longer periods of time has dramatically improved, and I have not had a cold or the flu since I started taking this product, the summer of 2007.